With a recent focus on "fake news" and the realization that many of us (adults and kids alike) get our news primarily through social media, the concept of "media literacy" is buzzing. And the #medialiteracy community is responding to this buzz with gusto. Below are a few framing ideas, planning tools, and media-literacy-infused project examples that can help you leverage this momentum, expand media-literacy education in your classrooms, and coordinate a media-literacy program schoolwide. Simply put, media literacy is literacy expanded to include all forms of communication -- whether that's a paperback book or a Twitter chat. Embracing that broader definition of literacy is essential for the development of curricula that can empower students to fully participate in all aspects of life these days. Given that schools vary in their priorities, digital resources, and student and teacher backgrounds, it can be difficult to prescribe a cookie-cutter approach to schoolwide media-literacy integration that works for all. The good news is that this reality allows us to develop unique pathways to student media literacy within K-12 schools. These pathways all stem from teacher passion, student need, and school philosophy. As you consider how to integrate critical media analysis into your teaching, try this four-step approach. 1. Imagine the profile of a media-literate student. 2. Use media literacy to reinforce your existing teaching objectives. Media literacy doesn't need to be a separate subject -- instead, it can be layered on to support your current curriculum. Chances are you have ideas for a media-infused project or two, or for routine classroom activities that use computers or tablets. 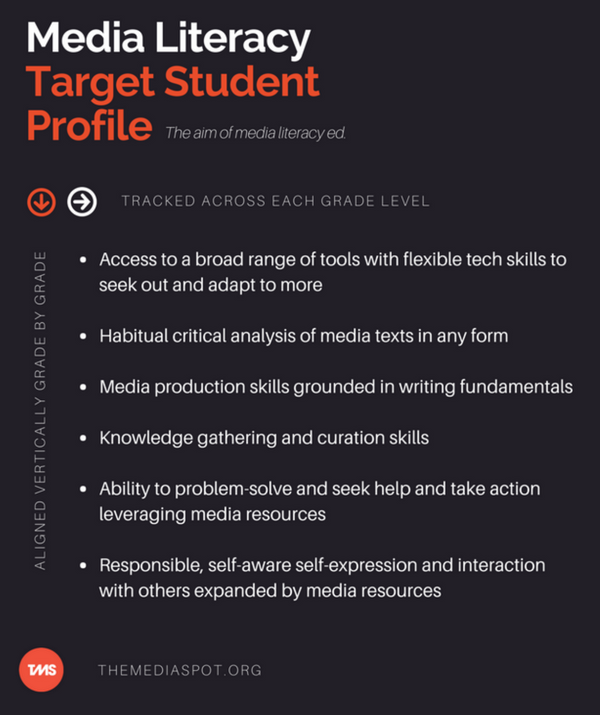 Think about how, with a little mindfulness of media-literacy concepts, those practices could help move students toward the target profile while also adding a new dimension to your core curriculum. 3. Work backward from your most sophisticated media-infused teaching plans. It’s challenging to have students learn a new tool while also thinking critically about the subject matter. To set up students for success, build in time for them to acquire new digital skills and to familiarize themselves with new tools, content, and concepts before putting it all together. For example, your idea may be to have kids do a close reading of news media video clips and add annotations using Screencastify. The objective may be for students to demonstrate their understanding of the content and identify any bias in the way the content was presented. However, in addition to core content skills, students need time to play with the features of the new tech tools and read up on key questions for analyzing media before they can put it all together. 4. As pockets of media-literacy practices build in your school, look to align them vertically. Once media literacy is authentically taking hold in pockets around your school, use a curriculum planning template (see The Media Spot’s Media Literacy Scope and Sequence Template) to ensure that across and within each grade level, you're incorporating digital skills and media-literacy concepts that build cohesively toward the media-literacy profile you have envisioned for your students. Here are some examples of K-12 projects with notes on how they emphasize media literacy alongside their core curricular goals on the path toward a media-literacy profile. Tiny Bop Robot Factory provides open-ended exploration and play that can lead to learning about engineering design. Curriculum Enhancement: This project supports generating content for poems and sparking creativity and engagement. Media-Literacy Focus: Students learn adaptable digital production skills connected to literacy fundamentals. They explore and build with an app, connect details in an image to generate text, and introduce elements of poetry. Takeaways: The backward plan from this project includes responsible use of classroom media, introduction to motor skills for operating the iPad, routines for working together, and basic operations through center time using academic apps. Whole-class Padlet walls create stories of American history decade by decade using found news, commercials, political ads, and movies. Curriculum Enhancement: This project supports inquiry-driven historical research. Digital Skills: Students learn to find and embed media artifacts in a shared online space as they create screencast tours of the decades. Media-Literacy Focus: Students learn how media messages affect the ways people see the real world as well as how they see themselves. Takeaways: Digital skills are in place, and students are analyzing the relationship between new and traditional media texts. They are also mindfully producing their own artifacts and reflecting on media bias, personal bias, and audience response. Curriculum Enhancement: This project help students convey complex ideas, concepts, and information clearly and accurately through the effective selection, organization, and analysis of content. Digital Skills: Students learn to produce videos using iMovie, accessing found video and images connected to text. Media-Literacy Focus: Students learn how when translating their writing into video format, their image choices can change the message. What lifestyles, values, and points of view are represented? How might different audiences read our messages differently? Takeaways: Adding specific images of police to student writing added significant meaning that triggered student and police audience members differently. Students had rich discussions around their media choices.